Fraser McGill, who lives in Dufftown, has hit out at EDF Energy. Speyside communities have claimed they are being shortchanged by £16million by an energy giant. Villages across the areas stand to benefit from the huge Dorenell Wind Farm, which is being built on the Glenfiddich Estate near Dufftown. However, despite Scottish Government guidance saying that communities should get annual payments £5,000 per MW of energy generated, developers EDF Energy have only offered £2,000. They have argued that since the guidance was published after the project was approved, they will honour the previously agreed £2,000 – and insisted there would be other non-cash benefits, such as a visitor centre, better paths and countryside rangers. However, the difference means a projected £27.5million fund over the course of the turbine’s 25-year lifespan could be slashed to £11million. And communities have now hit out at the energy firm and the land owner, claiming they stand to make a £1billion profit on the turbines. Talks have now been scheduled for this week in an attempt to resolve the dispute. 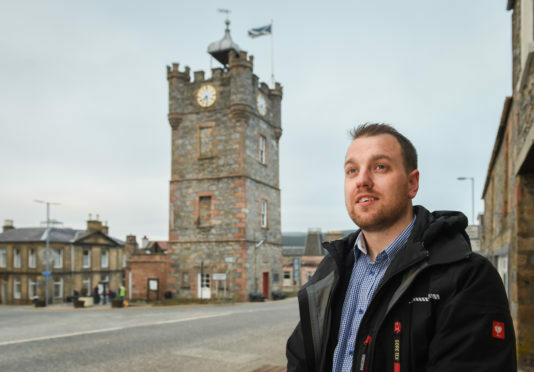 Fraser McGill, spokesman for the United Communities Impact Group, who lives in Dufftown, said: “We represent about 2,500 residents who already suffer the most expensive energy costs to consumers in the UK. “Our communities are in need of investment in support. The difference that the extra money would make over 25 years would be immeasurable. “EDF and the estate stand to generate in excess of £1billion profit. We can’t understand why they would choose not to support us. Communities in Dufftown, Glenlivet, Inveravon, Glenrinnes and the Cabrach, who all make up the United Impact Communities Group, stand to benefit from the fund. The first turbines for Dorenell are due to arrive at the site, which is about five miles from Dufftown, next month. It is estimated that the 59 turbines, which will be more than 400ft tall, will generate energy for about 84,000 homes when operational. Yesterday, Moray MSP Richard Lochhead pressed for a “rethink” from the energy company. He said: “It’s only right that communities in the north of Scotland, who ironically pay higher costs for energy, get their fair share of the income generated from such wind farms. “Many communities in Scotland get £5,000 per MW in community benefit, or even more. “Onshore wind has a valuable role to play in our energy mix but Moray’s communities must receive a fair share in the revenues generated from our natural resources. More than 640 objections were submitted about Dorenell when the plans first emerged. The development survived a second legal challenge from whisky firm William Grant and Sons, who own Glenfiddich, last month who argued that planning consent for the project had lapsed. John Penman, project deirector for Dorenell wind farm, said: “We bought the Dorenell project from Infinergy in November 2015 and fully adopted the community benefit principles put forward and discussed by Infinergy with the local community at a level of £2,000 per MW. We have always maintained that we would honour the previously made commitments. “The planning consent for Dorenell was granted in December 2011, some years before the Scottish Government’s good practice principles were in place. “Community benefit is not always just a monetary fund but enhanced mitigation can be included as part of the overall package and we are upgrading paths and creating warden and ranger posts as part of this. We are also creating a visitor centre and refurbishing properties for letting as the community told us this was important to help regenerate the Cabrach. “The wind farm will bring opportunities, growth and employment in the local area, with 10 technician jobs to be filled to maintain the wind farm and we will also be looking for two apprentices. We will also spend around £40million pounds with the Scottish supply chain alone in building Dorenell.